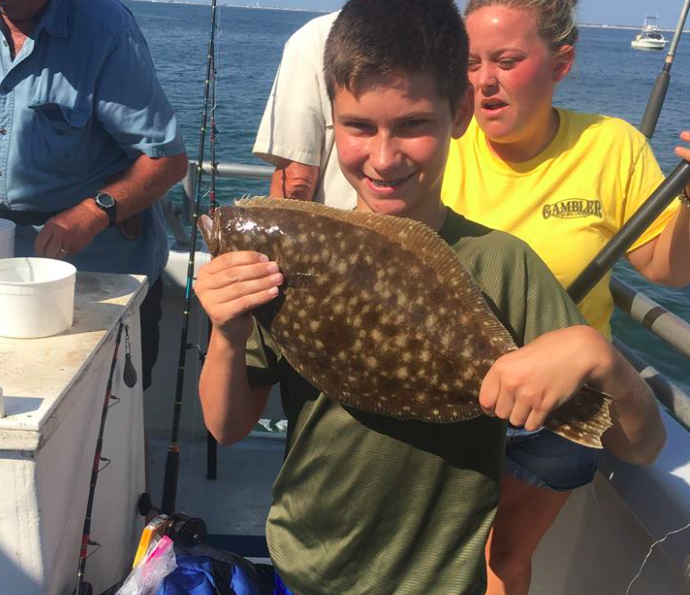 New Jersey’s fluke season will come to an end after the Labor Day holiday on Monday, making this weekend the last opportunity to catch a legal summer flounder until next spring. The best bet for a keeper this time of year will be in the ocean (or close to it, near the inlets), but make sure to check ocean conditions before venturing out. There will still be swells left over from the storm that moved by offshore over the week. “All the fluke reports came from the inlet,” the folks at Grumpy’s Tackle in Seaside Park said. Fishing reports from the beach were sparse this week as lousy weather and rough surf kept anglers home. Fluke fishing was good in the ocean before the storms rolled through, according to the crew of the Gambler party boat out of Point Pleasant Beach. “Lots of action on fluke with a fair amount of keepers,” a report said, noting pool winners have been 4-to-6 pounds most trips. Ralph Rivera caught a big one last Saturday– nearly 9-pounds! At The Dock Outfitters in Seaside Heights: “The back bay remains the spot generating all the fishing reports in our area,” a report said. Bluefish are being hooked in the 7-10-pound range are being caught on poppers and cut bait along the eastern shore (island side) of the bay, from the Dock’s own pier outside to the shop, all the way down to the flats behind Island Beach State Park. Blues have remained plentiful all summer and there are no signs of them stopping. If you’re looking to go crabbing, have a backup plan that includes the local fish market. Crabbing has been quite slow up and down the bay this season, and there hasn’t been much in the way of improvement reported over the past week. We’ll have a followup fishing report after we hear from the shops and boats out on Friday.